Somebody having limited knowledge about Indian society might regard this conversation as innocuous in nature. Of course, what’s wrong in being asked about your surname? Would it matter if we change the surname of Harry Potter to Harry Brown or Harry Blair? At least in Indian society the answer to this question is positive. One’s surname is a matter of utmost importance because it indicates one’s caste membership. Indian society is divided along various so called pure and impure castes. 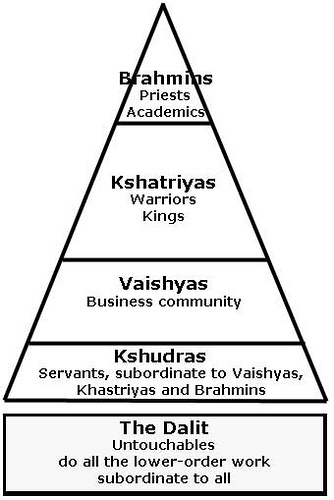 These castes are hierarchically placed on the social ladder. The surnames are divided across this caste hierarchy. Even though not a very trustworthy source of information, people still rely on surnames to infer other person’s caste and thereby social position. What’s wrong in being asked about one’s caste? It’s only human to categorize the other person and reduce one’s cognitive uncertainty. Well, for a person belonging to high caste it may be a matter of pride but for a person belonging to low caste it might constitute an instance of humiliation. You may have guessed by now. I am referring to untouchables in India- now called as Dalits. Caste is not written on one’s forehead. One interesting aspect that distinguishes caste from race is its concealable nature. One can know other person’s race by outward appearance but caste needs to be inferred by employing different means. Outward appearances are often illusory in relation to caste. Therefore, there is presence of an intrusive archeology of caste in everyday interactions in Indian society. This presence of caste in everyday interactions creates various problems of identity for Dalits. It should be pointed out that for Dalits the identity of caste is stigmatized in nature. It indicates thousands of years of servitude, exploitation and oppression on the basis of collective impurity due to being born in a community of untouchables. From a more gruesome side, it also indicates having a history of eating carrion, carrying dead animals, living outside villages, being treated worse than lepers and not being able to enter schools, offices and temples. The communicative thrust of ‘being asked about one’s surname’ is deeply related to stigmatized caste identity. In the hands of the upper castes, the banal act of ‘being asked about one’s surname’ becomes a means of emphasizing devalued nature of identity and derogatory history. It also constitutes non-recognition of individual identity. In other words, the banal act by the upper castes is an effort to make Dalits ashamed about their individual and group identity. This often leads to feeling of humiliation among Dalits. Consider this paradigmatic experience of Dalit humiliation. From time immemorial, Dalits were forbidden to touch the water lest there touch would pollute it. Everybody in the village or town could draw water from the common resource available except Dalits. Even animals like dogs, cows, and buffalos could drink water from the common resource without fear. Despite being human, Dalits were incapable even to touch the water. The dehumanizing message of this custom clearly indicated that Dalits are worse off than four legged animals. This was denial of human identity. It violates the sense of value and rights one naturally expects on the basis of being human. One of the most important emotional consequences of this identity denial is feeling of humiliation. When compared with this paradigmatic experience, the incident of ‘being asked about one’s surname’ seems very mild and micro in nature. However, to a dignified Dalit self, this micro-event can also lead to a feeling of humiliation. There is no need to experience bare treatment as an untouchable. Even though not a direct instance of untouchability, the innumerable micro-efforts to reassert stigmatized group identity indicate upper caste efforts to maintain a psychological distance from Dalits. This is, in a way, subtle practice of untouchability. This is clearly in dissonance with the value and rights a dignified Dalit self expects as an equal human being and an equal Indian. Dalit leaders like Mahtama Phule and Dr. Ambedkar seem to have realized this relationship between identity denial and feeling of humiliation. That is why they undertook dual task of creating a dignified Dalit self and destroying the basis of caste identity i.e. the caste system itself. Dalit masses also responded to the leadership of Phule and Ambedkar by rejecting Mahatma Gandhi’s paternalistic ‘Harijan’ identity and by radicalizing the content of Dalit identity. Dalit means "suppressed", "crushed", or "broken to pieces". Earlier the term Dalit implied an underprivileged condition, deprivation of basic rights and referred to the people who are suppressed on account of their birth in an untouchable caste. The meaning of Dalit shifted through a process of social creativity from simply describing condition to identifying a political process and a set of social relations. Now, the term Dalit does not merely express identity but it also conveys the aspirations and the struggle for change and revolution. In social psychological terms, Dalit is now a politicized collective identity. The Dalit experience in India suggests that there is need to understand humiliation as an emotional consequence of identity denial. Also, the anti-caste movement emerged in Indian context emphasizes that the feeling of humiliation, howsoever painful and negative, needs to be looked in positive light. On moral and political grounds, the feeling of humiliation is far better than the complacence with servitude, oppression and inequality because humiliation can motivate people to undertake collective action. The study of Dalit context, therefore, has lot to offer to the social and political psychological research on identity, emotion and collective action. We need to broaden focus of the social and political psychological research to include the experiences of various stigmatized groups around the world. It is in our hands to keep the struggle of creating a decent society alive. *Yashpal Jogdand is a PhD student based at the University of St Andrews, Scotland, UK. He is deeply interested in the issues of self-respect and human dignity at the individual as well as group level. His PhD project at St Andrews specifically deals with the phenomenology of humiliation in the Dalit context and an experimental analysis of the conditions under which humiliation might lead to collective action. I would like to know what can be consequences to the psychology of Dalit people and children born to them. What kind of psychological problems they are likely to have when they grow up. The multifaceted problems of our country are interconnected. To understand and solve these, we must view the dire problem in totality, not in isolation. We need a comprehensive multi-layer and multi-dimensional approach that considers economic, cultural, political and social factors. Inspired to participate? Share your thoughts with us! The ECC Blog is maintained by Lucas Czarnecki and Sumedh Rao. For all questions about the blog please email them. If you have news that you would like to share through the Blog, please submit it via the 'Share' page.